East meets West at the Western Montana School of Equine Massage in the heart of the Bitterroot Valley of Western Montana. Coreen Kelly, Owner/Instructor, brings traditional Chinese bodyworking principles together with western massage techniques as she leads each student through an exciting Level I - seven day Equine massage certification course and an advanced Level II five day Equine Reiki Acupressure certification course that will prepare them for a fulfilling career in therapeutic equine massage. Private classes available upon request (for a slightly higher tuition fee). Classes also available for the little to no horse experienced student. Because of the many varied plans please call Coreen at (800) 821-0014 or Cell/text (406) 961-8414 to discuss which option works best for your needs and experience. This personal contact allows us to 'meet' our students and get to know them a bit. Check out our NEW website at www.horsetouchmontana.com for current course schedule dates. These courses tend to be more than learning about equine massage. They offer the student the opportunity to strengthen their in-hand horsemanship skills, giving graduates of this program a professional edge in a growing competitive marketplace. Our teaching philosophies and exercises also offer the student the opportunity for deep personal growth with an enhanced awareness of the non-physical realities. These teachings are based upon Spiritual Quantum Physics which parallels the movies "The Secret" and "What The Bleep Do We Know". This course is truly 'beyond' the physical. The holistic format helps each student discover the energetic and spiritual nature of the horse as well as the physical qualities which provides the tools to integrate them into a seamless modality. Our small class sizes give each student the advantage of receiving individual attention from Coreen, the owner and instructor and plenty of hands-on work with a variety of horses. Experience Self Empowerment through Leadership for the equine species utilizing profession specific In-Hand horsemanship skills. Let your exciting journey to the unlimited career potentials in horse massage begin at the Western Montana School of Equine Massage. Join us for a life changing experience. 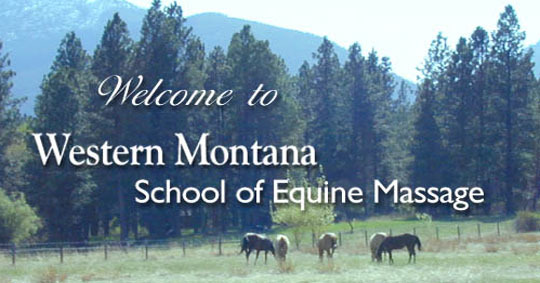 View our NEW WEBSITE at www.horsetouchmontana.com for current course schedule dates.